E-retailers are becoming increasingly aware of the importance of offline activities to attract new or re-engaging existing consumers. A recent study indicated around 95 per cent of retail sales are captured by offline retailers while two-thirds consumers who purchase online use the store either before or after the transaction. A State of Retail Report by TimeTrade highlights, almost 85 per cent consumers prefer to shop offline. They like to see, touch and test these products before buying them. Some retailers have even refused to publicise their own company’s website through in-store banners, fearing that customers would get sucked away from the store. Perhaps, that is why an increasing number of e-commerce players are partnering physical stores to ride the relatively new bandwagon called O2O (Offline to Online or vice-versa). 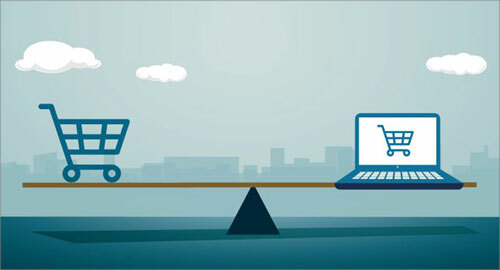 Startups such as online retailer Paytm Mall, food delivery company Zomato and logistics provider Shadowfax are all trying to bridge the gap between offline and online. The foundations for O2O were laid in the past one year with global competitors growing their offline networks in India. Amazon increased its offline presence in India with Shoppers Stop stake. And now, Amazon plans to add 100 offline kiosks to sell its own products in malls across India by the end of 2019. Walmart too plans to become the largest shareholder of India’s e-commerce giant Flipkart by expanding its grocery business in India. The online to offline (O2O) model is being adopted by many players in the fashion retail segment. Myntra for example, set the ball rolling with its plans to open 100 stores in different locations across the country. Some other online fashion retailers who plan to open offline retail stores are Voonik and Limeroad. Even smaller firms like Jaypore and FabAlley plan to shift to offline to gain in the overall sales volumes and increase the contribution from the offline stores substantially. Indeed, setting up brick and mortar stores has its own challenges as it is difficult for these companies to manage costs. Also, there is enough competition from the organised and unorganised sectors, both in the offline fashion retail. Varying circumstances make customers choose different buying environments. Successful retailers that outlast their competitors use a variety of formats and channels to meet their customers’ needs, and will continue to do so. According to Harish Shah, founder of online fashion retailer Fynd, when an online company simply opens a physical store without empowering any existing offline businesses, it is not an O2O but a hybrid model. Homegrown online retailer Flipkart through its fashion subsidiary Myntra has opened physical stores for its private labels such as Mango, Roadster and Esprit. Tech-startups are also working with restaurants and hotels to bring them online. Shadowfax has partnered with over 1,000 restaurants across 20 cities to deliver their online orders. According to the Alibaba-owned Hema Stores in China, a synergy between the offline and online operations can offer an immersive experience for shoppers. Both online and offline players can emulate the salient benefits of each other by using technology blurs the lines between the two. While a company may choose to focus more on online or offline depending on what kind of business model it has, a shift towards an omnichannel strategy would be highly beneficial.